"our study revealed a one-dimensional 'north-south' population structure". Years ago I used some books written in 1978 and 1979 as references for part of a research project on Polynesian origins where the authors claimed such a structure in China. In fact that structure has continued to be significant in helping to unravel Polynesian origins. Yes, it would be interesting to see Chinese genetic variation in the context of other Mongoloid groups. Chen et al. 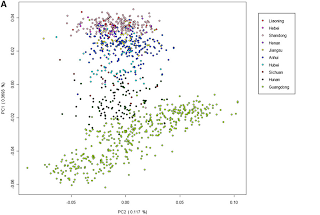 shows, for example, that the Japanese are closer in admixture proportions to Liaoning and other northern groups at K=2, while becoming distinct at K=3. 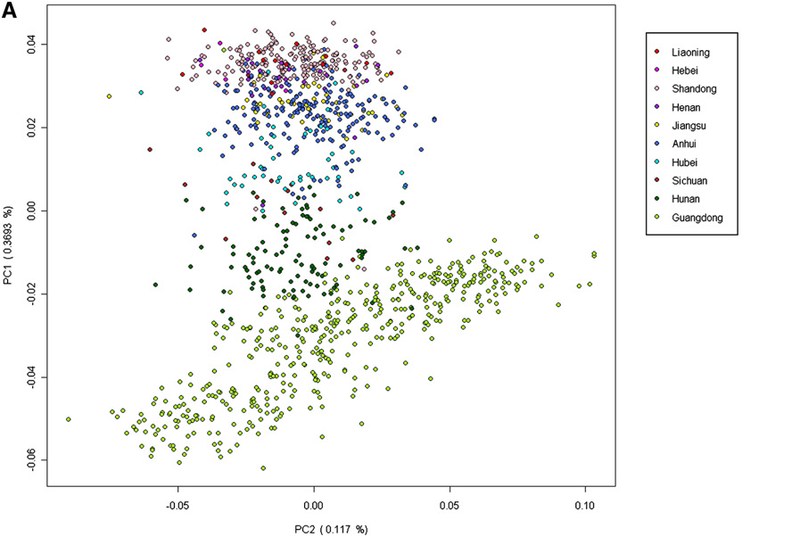 It would be nice to see a map distribution of haplogroups as well. Some observations from a westerner who has lived in China and (now) in Korea. (1) It is obvious to westerners that people from the dongbei (literally, east-north, in this study 'Liaoning', which abuts North Korea) are (generally) taller and lighter in complexion than southerners. Hebei ("River [Yangtse] north") is a province that surrounds Beijing and abuts Liaoning; people from this area fall on the cline. (I recall a cladistic study a few years ago which showed that northern chinese are more closely related to caucasians than to southern chinese.) The obvious hypothesis involves introgression from russia. I do not see any data from 'further north' in China (Heilongjian and Jilin, much more affiliated with the Russian far east). Samples from there and from Inner Mongolia would be interesting. (2) Japan was colonized by people from Korea. This explains their similarity (K2) with people from Liaoning. A further study of korean genetics would be very informative. I predict that they are intermediate between Liaoning and Japan. "Hebei ("River [Yangtse] north") is a province that surrounds Beijing and abuts Liaoning; people from this area fall on the cline." As a fellow "Westerner," I am ashamed that you would confuse the he of Hebei, which refers to the Yellow River (Huang He), for jiang, which refers to the Yangtze River (Chang Jiang). The difference between NE Asia ( Japan and Korea) and Han chinese is the ratio of Y haplo O2 and D1. which is less in Han chinese. Coincidentally same clades appear in Tibetans. May be that is the difference at K=2. It could have been nice if they extended this study beyond singapore to Malaysia and Indonesia where again you can see O2-95. Ebizur: You're correct. My mistake. Shoddy research on my part. @ Derek : "I recall a cladistic study a few years ago which showed that northern chinese are more closely related to caucasians than to southern chinese"
Are you sure you're not confounding with studies about the 500 BC population of Linzi (Shandong, China) ? waggg: No, that's not it. The cladogram I'm thinking about was in a book (Cavalli-Sforza maybe?) and pertained to modern Chinese populations. I took the point that cladistic analysis is not appropriate if populations still interbreed after they "split". I believe the authors also reached the same conclusion: that significant "caucasian" genetic material had seeped into the northern han gene pool. A five-fold difference between the 2 studies. Also notice, in the 2nd pdf, that there's a cluster of results in the right part of the graph. Those are obviously the Xinjiang samples (northwest China). Their FST distances to eastern Chinese regions seem to also average between 0,0100 and 0,0150. The Japanese islands may have been peopled by immigrants from the mainland, today's Korea, but the Ainu have contributed somewhat to Japanese genetics, as did people from the south. The Japanese are not homogeneous unless you mean they have mainly bred with each other exclusively for thousands of years to produce a consistent hybridized or mixed predominantly East Asian. "The Japanese are not homogeneous unless you mean they have mainly bred with each other exclusively for thousands of years to produce a consistent hybridized or mixed predominantly East Asian". True of every other 'ethnic' group as well. Although obviously not all are East Asia. Instead of peering down microscopes just take a tour of China. Of course, people are different because they are different races. Just like in USA, you have Irish, Italians, Japanese, people from China and all parts of the world. China is a vast region with many people living there since time immemorial. The Han is not even a race but a label (named after the Han dynasty)created by post imperial China's leaders to group people for nation building purposes. Only those that could be passed off as one 'Han race' were included in that grouping. Others, like Tibetans obviously are a group of their own. Over time people there will be some 'merging' when people inter marry. My dad was Hakka, mum Hokkien, on paper, but their dads and mums inter married too and so forth. I probably have more than a dozen mix of Hakka, Hokkien, Cantonese, Foochow and I was told some Portuguese as well.